The Campanil strongly disagrees with North Carolina’s decision to pass a new bill that restricts rights for LGBTQ people. Confessions of a grad student | Burnout and what’s the next step? Grad student Dajanae Barrows looks to what the next phase of her life has in store. 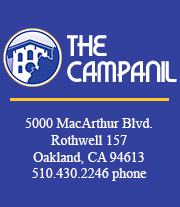 As the exportation of coal becomes an issue for Oakland, The Campanil has a few things to say. Mayor Libby Schaaf’s reorganization of certain job programs have caused an uproar. The Campanil shares its view on the issue. Dajanae Barrows turned the frustrating experience of having an announcer skip over her name because it was hard to pronounce into an empowering one. The staff editorial concerns the death of civilian Akai Gurley at the hands of an Asian San Francisco Police Department officer. Need some bad love songs for Valentines day? Look no further! Dajanae Barrows is the Opinions Editor of The Campanil and has been on staff since Fall 2014. She is a 2nd year graduate student. Contact her at barrows@thecampanil.com.